There are at least 16,000 awkward things about dating, especially those early dates. One of the most awkward — and one of the most likely to show up in questions to online advice columnists — is figuring out when to share a potentially sensitive fact about yourself. After all, there can be a fine line between letting the other person get to know you better and completely oversharing, and depending on the subject some of these conversations can be horrifying. It’s one thing to explain that you have an uncle who’s convinced there are aliens living in his rosebushes, and quite another to have to admit that you’re a werewolf, as happens in Simon’s Quest. Simon (Johnny Pozzi) was a regular guy until one night and one bite turned him into a werewolf. He isn’t alone, at least, even though James (James Tison), the guy who turned him, vanished immediately thereafter. No, this is a world with plenty of monsters around, vampires and demons as well as werewolves, though they generally prefer to be called the afflicted rather than monsters. But Simon hasn’t had the nerve to date since he was turned, and Gwen (Talley Gale) and Robert (Lucas Brahme) want to change that. 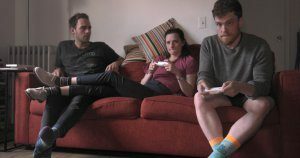 Robert, Gwen, and Simon play games and talk Castlevania. It’s a nice thought but they aren’t really all that helpful, since their main focus is on making a documentary about Simon’s life as a werewolf. They get him on Tinder and act as cheerleaders, but I’d be more than nervous enough about dating without two people watching (and recording) my every move. But he gets a match with a guy with the unlikely name of Skyye, and Simon tentatively starts trying to get other aspects of his life back together as well. He joins a support group for the afflicted, and with help from the group’s new leader, Pat (Timothy J. Cox), takes his first steps towards becoming part of the world again. But there are plenty of things waiting to trip him up along the way, and telling Skyye the whole truth might not even be the worst one. With a solid script and capable directing from Marley Jaeger, it’s a wonderful mix of drama, humor, a touch of fantasy, and a dash of riotous satire — Axe Alucard (Anibal Nobel), monster hunter, is wildly over the top, as is Liz (Liz Days), the former support group leader, though honestly the demon in the group (Krystal K.C. Wilson) seems pretty nice. But Simon’s Quest also has plenty of genuinely touching moments, as Simon is constantly torn between his own deep loneliness and the very real chance that he might wake up the morning after the full moon to discover that he’s shredded the person he cares about most in the world. We all worry about hurting the ones we love sometimes, just not usually quite so literally. There are obvious parallels between the plight of the monsters — sorry, afflicted — and the similar situations often faced by the LGBTQ community in the not too distant past. And it still isn’t all that easy to be anything other than mainstream in all your life choices, even these days. But this parallel is handled just as discreetly as the monsters are, without a drop of blood or a single sharp, shining fang appearing on-screen. It’s the quiet, gentle Simon and his very ungentle curse that will capture the audience, and rightly so. In these internet days it’s easy to forget that every bit of suffering you hear about has a human face attached — even if once a month that face might turn fanged and furry — and this compelling short film reminds us brilliantly of that.